. :: The Perils Of Show Jumping Sport - 8 ::. Well the day has finally arrived!! Sumas Zorro was hand-delivered by Sam this morning accompanied by her groom for the week Trisha Gallagher into the Caen stables; that process took about ten minutes…the rest of the procedure though was a tad more complicated!!! Sam has basically spent the morning whizzing from place to place - and at this stage really wanting to go back and beat up his school teachers for not suggesting he took French as an option way back!!! Of course, (apologies to my many lovely French friends) our neighbours across La Manche are not exactly bending over to help and I think that the one word now foremost in his newly acquired language is "non!" His first major challenge has been to acquire the accreditation for himself and Trisha for the week - a pretty basic thing which as you need it to get into the stables you would assume you would get from the stables - eh that would be "non!" He finally got someone to tell him helpfully that it was fifteen a minute walk away...or he could try to find a shuttle - which I am pretty sure he needs the accreditation to use for. And so the madness continues! In meantime I am also in France but in the South!! After the show in Macon last week Sam and I flew to Cannes to have a break before the show started (me for a week, Sam for two nights. 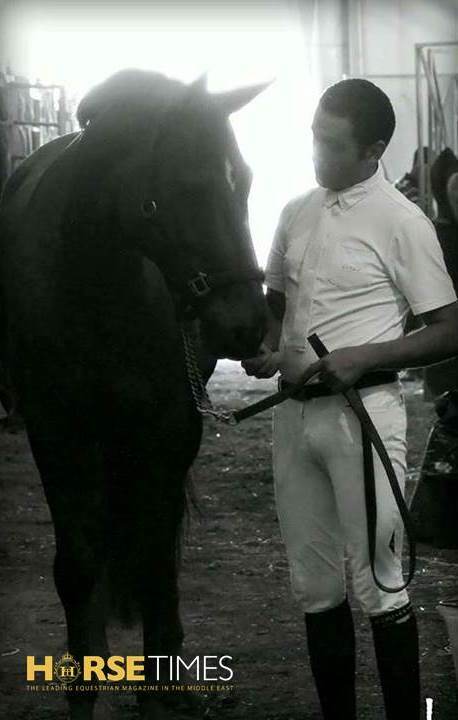 Well he is in training... Hehe) whilst the horses moved to Normandy where they were to be stabled in St Lo., thanks to fantastic friends of ours Scott and Helen Smith. Although we nearly did not make it as true to form the journey to the airport in Lyon did not exactly go to plan!!! It all started well - we left with plenty of time for the journey - determined for once not to arrive running after the plane, or waving it goodbye as happened previously. I plugged in my phone and tried to put Lyon airport into the navigation....Mmmm apparently in the iPhone world it had ceased to exist - France etc. was there but when I tried to locate the airport - you guessed it - I got "non!". Sam then decided in true male fashion that he did not need the map anyway and he knew the road! Ten minutes later the navigation finally kicked in and told us to immediately take a sharp left - which with Egyptian driving tends to be rather sharp indeed! We continued along this very random little French road until suddenly a gendarme jumped out in front of us (very brave of him considering Sam drives like he rides - and he doesn't often get time faults). We immediately reverted to tourist mode, i.e. I suddenly lost my ability to speak French. Sam and I nervously waited, watching the clock tick by. Eventually what seemed like an hour later all paperwork was found to be in order and we went to continue - although first I thought I’d better check we were heading the right way! I gestured if the airport was this way - for the reply “this way no fly - only swim!!" Apparently this route was headed straight to a lake!!! We did however manage to get to the airport finally - and with it being delayed for an hour we were for once even early! 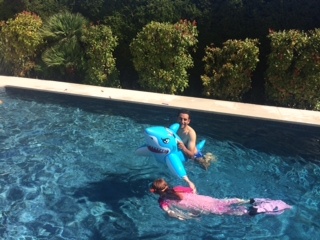 Scroll down: photo of Sam learning to avoid the sharks - valuable training in our industry hehe! I hope the horse in final four will be a bit easier than this one to get on!! !